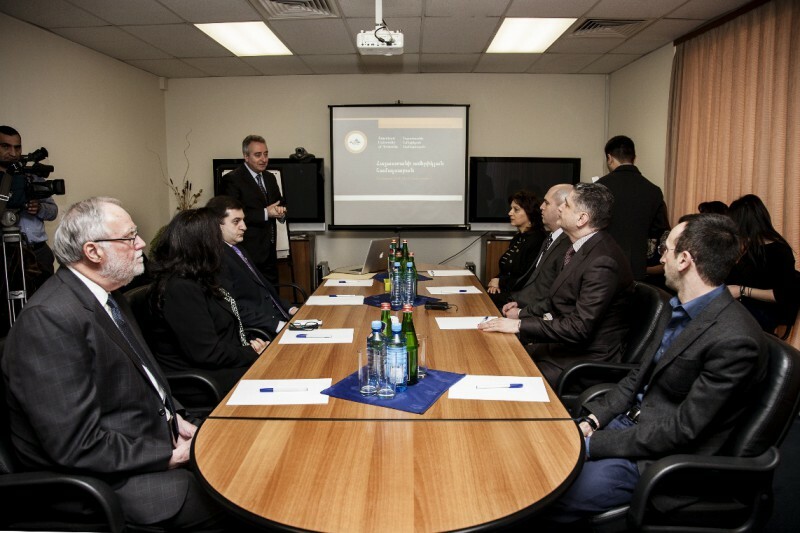 YEREVAN, Armenia – On February 25, 2014, the American University of Armenia (AUA) hosted the Prime Minister of the Republic of Armenia Mr. Tigran Sargsyan for a meeting at the AUA Business Center on the topic of AUA’s recent and upcoming initiatives in the education sector. Prime Minister Sargsyan, Republic of Armenia Minister of Education and Science Armen Ashotyan, Republic of Armenia Deputy Minister of Education and Science Karine Harutyunyan, and representatives of the Bologna Follow-Up Group were welcomed by AUA Provost Dr. N. Dennis Leavens, Vice President of Institutional Advancement Ms. Maral Chalian, Vice President of Operations Mr. Ashot Ghazaryan, and Vice President of Finance Mr. Gevorg Goyunyan, with AUA President Dr. Bruce M. Boghosian unable to attend because he was out of the country. Representatives from AUA gave a brief presentation about the history of AUA and its current and future educational and research initiatives, such as the recent launch of the undergraduate programs, aid for Syrian-Armenian students, and the expanding continuing education programs in the regions of Armenia and the Republic of Nagorno-Karabakh. AUA Vice President of Operations Mr. Ashot Ghazaryan presents AUA’s activities and initiatives.